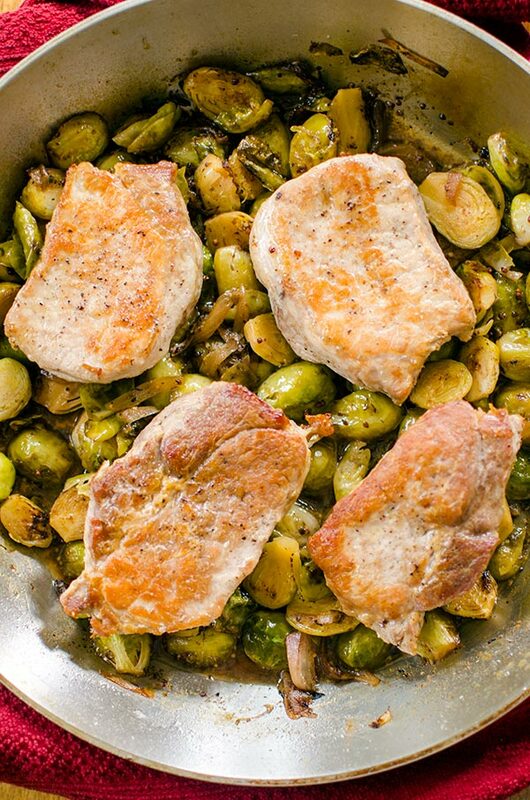 One-pan pork with Brussels sprouts is an easy dinner for the whole family with boneless pork chops, shallots, apple cider and Dijon mustard. If Brussels sprouts are on the menu, it’s almost guaranteed I’ll be ordering them. Do you have foods like that? Something that you see on a menu and no matter what, you have to order it, even if you have the best intentions (‘This time I’ll get something different’). Yeah, same. It’s the same reason I find I love to cook a lot of the same foods over and over again (i.e. pairing pork with Brussels sprouts). What can I say, I’m a creature of habit. I think we all are. Not that there is anything wrong with that. I think we’ve all seen how good habits can be for us. But as with everything, there is a flip side. A reverse, ‘these habits might not actually be that good for me’. The truth is, ordering Brussels sprouts at a restaurant is not a habit, it’s a choice, but I think habits are definitely something we should think about more often. 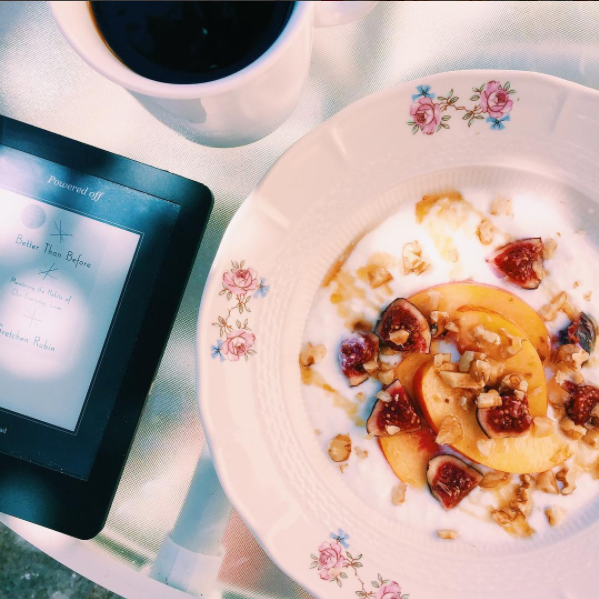 I read Gretchen Rubin’s Better than Before a couple of years ago and there were definitely a few takeaways that have really guided me. My favourite lesson? I think this is such an important thing to understand. There are so many books about the habits of “the most successful people”, or you may look at your colleagues or friends and think ‘How do they do that?’. But, the key is understanding ourselves. I’m the kind of person that can start and change habits pretty easily when I set my mind to it. But it’s pinpointing the habits that is a little harder for me. Since January I have changed a few habits; I’ve cut down the amount of coffee I drink and now start my day with a glass of warm lemon water (I’ve also been focusing on drinking a lot more water throughout the day). I’ve started eating breakfast (remember when I was trying to figure out how to not be so tired all the time? Breakfast was part of this. ), and instead of scrolling through Instagram or emails before I go to bed, I now wind down with a book. And let’s not forget my work-in-progress journey in positive thinking! These five habits weren’t that hard for me, I just set my mind as these small changes will improve and enrich my life, versus eliminating things that aren’t working. Again, it’s all about the positive spin, right? Anyway, the fact that these habits didn’t take too much work, makes me want to take on more good habits and small changes to improve my everyday. Here’s what I’ve got planned for the next little while–I’m choosing not to set a date for them because I don’t think they are habits until they become second nature. Over the next little while I’m going to continue along my positivity work-in-progress habit and start on taking the stairs more than the elevator. This is a simple and quick recipe for dinner because it’s all made in one pan. It starts on the stove top, searing the pork chops, then you add the Brussels sprouts and shallot. Deglaze with apple cider vinegar and pop it in the oven. It’s really as easy as that. Heat 1 tbsp of olive oil in a large oven-proof skillet. Season pork chops with 1/4 tsp salt. Sear pork for 3 minutes, flip and cook another minute. Remove from pan and set aside. Add remaining 1 tbsp of olive oil, shallots, Brussels sprouts to pan with 1/4 tsp of salt. Saute for 5 minutes. Stir in apple cider and Dijon mustard. Return pork to pan. Transfer to oven and roast uncovered for 15-18 minutes or until pork is fully cooked. 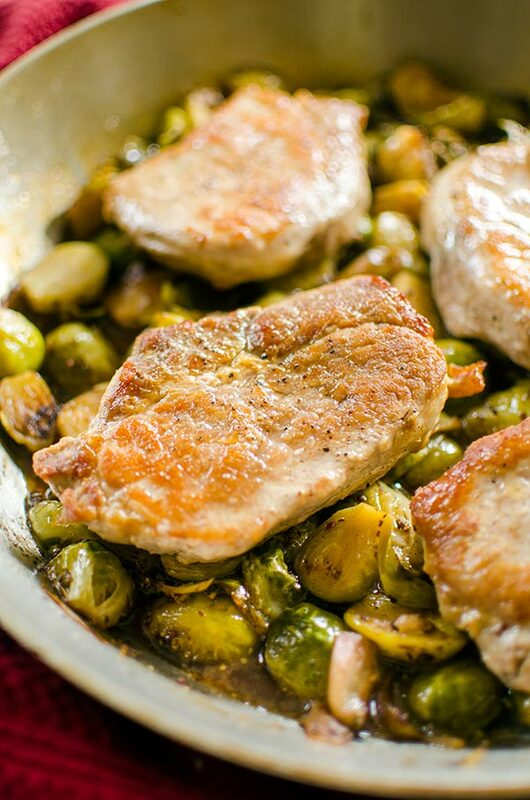 Let me know if you give this one-pan pork with Brussels sprouts a try in the comments below and let me know about the habits you are working on. Made the pork chops with Brussels sprouts Turned our wonderful. Thank you. I try to keep keto diet but others don't. I made rice for them and everyone loved it.